2015 is the year we celebrate Patrick Knight because he has been a singer, songwriter and extraordinary performing artist for 30 years now. In 1986 he released his debut 7 inch vinyl single "I don't love you anymore". Available now as a mp3 download. Starting of as a play-back & soundmix artist in 1985, Patrick Knight managed to perform as an almost perfect copy of the legendary Boy George. He got noticed by Riky Travers in 1986 who offered him the chance of recording his very first debut single. 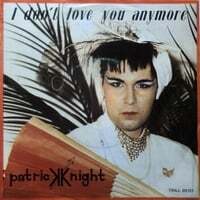 Patrick Knight wrote the lyrics and sung the words to Riky Travers who composed the music for "I don't love you anymore". The song was a way for Patrick to express his feelings about admitting being gay. Although he loved his girlfriend, he had to brake up with her not wanting to hurt her feelings. Leaving her with a lot of questions, it seemed the easier way to put words and feelings in a song. After 30 years they are still best friends and both of them happily married. The B-side of the single was a tribute to Boy George. With the title "Share my dreams" he wants to share the happy moments with everyone he loves. When you listen to this song on the flipside you will find the link to Culture Club's hitsingle "Do you really want to hurt me". The single was only released as a 7 inch vinyl single which sold out in only a couple of months. 30 years later it's available as a mp3 track in it's original form for everyone to enjoy.